This article is about the Atlantic Coast Line in Cornwall, UK. For the Atlantic Coast Line Railroad in the United States, see Atlantic Coast Line Railroad. The Atlantic Coast Line is a 20 3⁄4 miles (33 km) Network Rail branch line which includes a community railway service in Cornwall, England. The line runs from the English Channel at Par, to the Atlantic Ocean at Newquay. The Atlantic Coast Line starts from Par station, in the village and port of Par. The station is on the Cornish Main Line, and trains to Newquay use a curve of almost 180 degrees before joining the route of the original Cornwall Minerals Railway near the former St Blazey station. The route of the CMR is followed for the rest of the journey. Originally built as a standard-gauge tramway from the 1840s to serve Newquay Harbour, the line was upgraded for locomotives in 1874 and passenger services began between Newquay and Fowey on 20 June 1876. There was no connection at the present Par station until 1892 when the broad-gauge main line was 'narrowed' to standard gauge by the Great Western Railway and the connecting curve was built from St Blazey. From St Blazey, the CMR was built along the course of the even earlier Par Canal, originally built to serve the nearby Fowey Consols mine, as far as its terminus at Pontsmill, where the Luxulyan Valley is entered. The thickly wooded terrain and steep granite slopes of this valley surround the fast-flowing River Par, contain a large concentration of early 19th century industrial remains and have been designated a World Heritage Site. Shortly before reaching Luxulyan station, the line passes under the Treffry Viaduct, an historic railway viaduct and aqueduct that was built in 1844. This both supplied water to the Fowey Consoles mine, and also carried the main line of the Treffry Tramways, a precursor to the CMR. After Luxulyan, the line passes close to several former and current china clay works, before passing through Bugle and Roche stations. 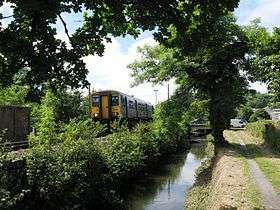 Between Roche and St Columb Road stations, the line passes through Goss Moor nature reserve, where a low bridge carrying the railway over the A30 road had been the site of accidents when vehicles collided with it. There was a 1986 proposal to abolish the bridge by diverting the line so that trains would have started from St Austell railway station and continued via Burngullow and the old Newquay and Cornwall Junction Railway freight-only line, joining the current route between Roche and St Columb Road at St Dennis Junction. This proposal was later abandoned after a new route for the road was found that avoids the bridge. After St Columb Road, the line passes through the last intermediate station at Quintrell Downs before reaching the terminus at Newquay. The busiest station on the line is Newquay, where more than 10 times the number of passengers arrive and depart each year than the other stations added together. The annual passenger usage is based on sales of tickets in stated financial years from Office of Rail Regulation statistics. The statistics are for passengers arriving and departing from each station and cover twelve month periods that start in April. Please note that methodology may vary year on year. The statistics cover twelve month periods that start in April. 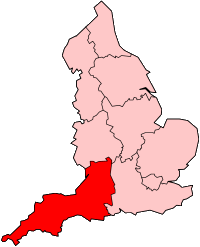 The Atlantic Coast Line is one of the routes covered by the Devon and Cornwall Rail Partnership, an organisation formed in 1991 to promote railway services in the area. The line is publicised in several ways, including regular timetable and scenic line guides as well as leaflets highlighting attractions on the route. The Atlantic Coast Line rail ale trail was launched in 2005 to encourage rail travellers to visit pubs near the line. There were originally 16 pubs but one has since closed. There are three in Newquay, two at St Columb Road, six in and around Par, and one each at Quintrell Downs, Roche, Bugle and Luxulyan. 5, 10 or 15 stamps collected in the Rail Ale Trail leaflet entitle the participant to claim special Atlantic Coast Line Rail Trail souvenir merchandise. The local passenger service on the line was designated by the Department for Transport as a community rail service in September 2006. This aims to increase the number of passengers and reduce costs and includes the investigation of how to get a better spread of train times during the day, and how to increase train services in the peak summer season. The line itself is not a community railway (unlike the other Cornish branches) because it also carries intercity trains during the summer and freight trains throughout the year. 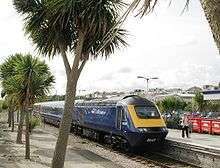 Focal, a local "friends of the line" group helped to achieve a 75% increase in Par to Newquay passenger services through negotiation and cooperation with the Devon & Cornwall Rail Partnership and Great Western Railway. The line is single from St Blazey to Newquay, apart from one passing loop at Goonbarrow Junction, just south of Bugle. It is the last remaining 'crossing place' between St Blazey and Newquay. It is used by china clay traffic and also passenger trains in the summer, when there is more than one passenger train on the branch. The loop uses semaphore signals. Local passenger services are operated by Great Western Railway. Most local stopping services on summer Saturdays are replaced by a mixture of Great Western Railway intercity trains from London Paddington and CrossCountry trains from the North of England, which do not call at intermediate stations on the branch. Great Western Railway generally add an additional (ninth) coach to their HST sets which is used exclusively for luggage. Crowd-control measures, comprising additional barriers, staff and ticket checks, are often necessary at Newquay on summer Saturdays. In 2007, First Great Western (now known as Great Western Railway) began running a through service from London Paddington on Mondays to Fridays in July and August in addition to the two or three running on summer Saturdays and one return working on Sundays. Many of these workings are named The Atlantic Coast Express. Some of the Saturday direct services are true express services calling only at Par, Plymouth (set down only), Exeter St David's (set down only) and London Paddington. The eastern section of the line - as far as Goonbarrow Junction - sees a large amount of china clay freight traffic operated by DB Schenker. This company operates a depot to service locomotives at St Blazey, north of Par. A freight spur connects the line at St Blazey with Par Harbour, passing under the main line from Par to St Austell to reach the harbour. Although originally built as part of the Cornwall Minerals Railway to convey mineral traffic to the harbour, today it is principally used to convey dried china clay from the clay dries at the harbour. On 25 May 1991 the first train of the day from Newquay to London Paddington derailed in the Luxulyan Valley. The train consisted of a High Speed Train unit. The passengers were transferred to the rear power car which was then uncoupled and run slowly back to Luxulyan railway station where the passengers were transferred to road vehicles to continue their journey. On 30 December 2006 heavy rainfall caused a landslide on an embankment near St Blazey, blocking the line. A replacement bus service was run to cover for the passenger service, until the line reopened on 8 January 2007. On 12 June 2007 a train collided with a car at Chapel level crossing, on the outskirts of Newquay. The crossing is an Automatic Open Level Crossing, where warning lights and a siren give warning of the approach of trains but no barrier is provided. The siren and lights were found to be working. The car driver was injured, but no-one on the train was hurt. 1 2 "Par to Newquay (The Atlantic Coast line)" (PDF). Great Western Railway. Retrieved 25 October 2016. 1 2 3 Ordnance Survey (2005). OS Explorer Map 107 - St Austell & Liskeard: Fowey, Looe & Lostwithiel. ISBN 978-0-319-23708-3. 1 2 "Luxulyan Valley". Cornwall & Scilly Historic Environment Service. 2006. Retrieved 24 May 2007. ↑ "A30 Goss Moor Briefing". Cornwall Friends of the Earth. Archived from the original on 25 May 2007. Retrieved 23 May 2007. ↑ "Moor dualling plans get go-ahead". BBC. 29 November 2004. Archived from the original on 16 May 2007. Retrieved 23 May 2007. ↑ Ordnance Survey (2005). OS Explorer Map 106 - Newquay & Padstow. . ISBN 0-319-23707-9. ↑ "Station Usage". Rail Statistics. Office of Rail Regulation. Archived from the original on 10 April 2010. Retrieved 2010-03-25. ↑ "Local". Celebrating Success. Local. 2008. Retrieved 2008-11-18. ↑ Vaughan, John (1991). The Newquay Branch and its Branches. Sparkford: Haynes/Oxford Publishing Company. ISBN 0-86093-470-5. ↑ "Depot Information - Wales and Western". thejunction.org.uk. Retrieved 24 May 2007. ↑ "Transport Background Technical Report - South West Regional Spatial Strategy" (PDF). South West Regional Assembly. September 2006. p. 20. Retrieved 23 May 2007. ↑ Surl, Malcolm (2007). "Solo HST power car". Modern Railways. Ian Allan Ltd. 64 (705): 32. ↑ "Derailment of a High Speed Train in the Valley". LoxSoft. 2007-04-26. Retrieved 2013-08-27. ↑ "Landslide closes rail branchline". BBC. 3 January 2007. Retrieved 23 May 2007. ↑ "Driver injured in train collision". BBC. 12 June 2007. Archived from the original on 16 June 2007. Retrieved 13 June 2007. Wikimedia Commons has media related to Atlantic Coast Line, Cornwall. Great Scenic Railways in Devon and Cornwall.